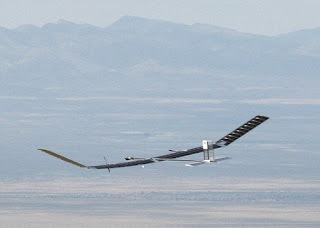 The UK-built Zephyr solar-powered plane has smashed the endurance record for an unmanned aerial vehicle (UAV). The craft took off from the US Army's Yuma Proving Ground in Arizona at 1440 BST (0640 local time) last Friday [7/9/10] and is still in the air. Its non-stop operation, day and night, means it has now gone four times longer than the official mark recognised by the world air sports federation. Project manager Jon Saltmarsh, a spokesman for QinetiQ, the developer of the craft, says they plan to fly it for another week before landing. "Zephyr is basically the first 'eternal aircraft'," added Saltmarsh. Zephyr is recognised as a world leading Solar Powered high-altitude, long-endurance UAS. Its goal is to provide a persistent, stable, high altitude platform for surveillance, communications and rapid delivery to forces in the field. This Zephyr represents a leap forward from the aircraft flown in 2008 and 2009. Significant company investment has gone into proving the reliability of the latest version. Zephyr is now 50% larger than previous iterations to better accommodate the vital equipment it needs and with a 22.5m wingspan its over 4m longer. It also includes a new integrated power management system, has an entirely new aerodynamic shape and a ‘T’ tail design. While this success breaks records for unmanned flight its significance is far broader. The purpose of the Zephyr project is enhanced military surveillance. We have had decades of spy satellites, equipped with sophisticated imaging equipment watching wherever and whatever their owners want. 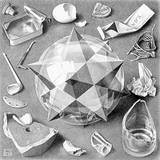 However, satellites zoom by; they cannot monitor one spot continuously. Having UAVs like those the Zephyr presages changes the capabilities of the surveillance society. Who among us will now have any expectation of privacy? On a more positive note, Zephyr shows that it is possible to create something like a perpetual machine, that can run indefinitely, limited only by maintenance needs. * The Zephyr is relatively light at 50kg, and unmanned, but the energy needed to keep it aloft, carrying its lithium-sodium batteries and payload equipment, is large. It should be possible to scale it larger still, and carrying more weight, including people appears likely. In addition, there is no reason that the combination of technologies that makes this triumph possible cannot be extended to other kinds of machines than ultralight airplanes. The cost may be high for some time, the technology esoteric, and the weight-minimization requirements demanding, but there is no reason in principle that such an approach could not also work for other kinds of transportation such as trains, or even cars. * Not truly perpetual of course; the laws of thermodynamics have not been repealed. But within the remaining lifetime of the shining sun, another 10 billion years or so.